At last, rank and file professors at Boston College have had enough. They have demanded an independent inquiry into the way the college’s leadership funded, organised and oversaw the Belfast Project oral history archive on the Troubles. Such an inquiry is necessary to get to the bottom of the college’s disgraceful handling of the PSNI subpoenas. They have also launched a petition which can be seen and signed here demanding action by the college authorities and have asked members of the public in Ireland and Britain to put their names to it. So far, the powers that be at Boston College have ignored their own staff and are refusing to hold an inquiry. Sort of makes you think they might have something to hide. If you put your names to this petition it will make it harder for them to continue doing that. Ruth Dudley Edwards has written this cutting assessment of Guardian blogger, academic journalist and Sinn Fein confidante, Roy Greenslade. The intro to the piece says he is a correspondent upon whom a green mist has descended. Personally, my problem with characters like Greenslade is not that mists have descended upon them, whether green, red or blue, but that they are dishonest about it happening. There is absolutely nothing wrong with journalists holding political views; the error is in not declaring them when writing about the subject. In Greenslade’s case his sin lies in not admitting his sympathy for Sinn Fein when he writes about the party or matters which concern it and in case of any misunderstanding by readers my opinion of this would be the same, and often was at a time when it was unpopular and even career threatening to say so, if it was Eoghan Harris writing about the North. 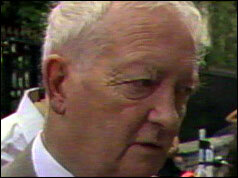 A reader, Sean Gallagher has written in to say that SF MP, Pat ‘Smiler’ Doherty is the uncle of Roy’s wife. Can anyone confirm this? Slowly, but inexorably, the penny is dropping, both here in the United States as well as back in Ireland. The Boston College subpoenas seeking access to oral history interviews with former IRA activists on behalf of the police in Northern Ireland are about the dumbest things that have ever happened in the long relationship between the United States, Britain and Ireland. The difficulty is not how to describe why they are so dumb, but in counting the ways in which they are so dumb. First of all, this is not the way in which to heal a conflict like that in the North of Ireland. Over 3,000 people died and tens of thousands were scarred, physically and mentally, by a war that was undoubtedly one of the longest and most violent, if not the most violent in Irish history. But the war has now ended, peace reigns and there is a desperate need for dealing with the past in a way that solidifies that peace and ensures an untroubled future. The British have chosen a way that does the opposite. The Boston College subpoenas symbolize an approach to this issue based on revenge and the view that alleged combatants in that war should be dragged before the courts, convicted and jailed. To do this, they created a special police unit, the Historical Enquiries Team (HET), put it under the control of the Police Service of Northern Ireland (PSNI) and authorized it to dig up evidence to support criminal prosecutions. The emphasis in this approach is on retribution and punishment. Yet anyone who has had dealings with victims of the violence in Northern Ireland knows full well that most just want to know what happened to their loved ones. Who killed their father, brother, son, mother, sister, wife? Why did they do it, and did their loved one suffer? There are exceptions of course but most I have had dealings with seek the truth, not revenge, and I strongly suspect they are in the majority. What they want most of all is a proper truth recovery process. South Africa provided one model, a truth and reconciliation commission in which perpetrators were offered an amnesty in return for full candor about their deeds. They could have chosen the British version and opted to scratch away at barely closed wounds but did not, knowing that to do so would mean that South Africa could never put the past behind it, that the past would continue to haunt the present and the future with catastrophic consequences for all South Africans. The second way in which the Boston College subpoenas are dumb is because they are so politically stupid. Ostensibly, the subpoenas are in pursuit of the perpetrators of the murder of Jean McConville, but anyone who is familiar with the case knows that it is really about getting Gerry Adams who is alleged to have given the order to “disappear” Mrs McConville, an accused spy for the British Army. Whatever one may think of Gerry Adams and his misguided efforts to deny any past association with the IRA, the reality is that Northern Ireland would not now be enjoying peace without his efforts. have exaggerated the political benefits of the Good Friday Agreement, but the stark truth is that he did bring this awful war, this endless bloodshed, to an end. I doubt that anyone else could have. Yet the logic of the Boston College subpoenas is to drag him before the criminal or civil courts and stain him with the McConville murder. So the architect of a peace process centered on compromise ends his political life arraigned or sued for murder courtesy of the same government with whom he compromised. And this is supposed to cement the peace in Northern Ireland? And this is supposed to strengthen the peace in Northern Ireland? If this is the logic behind the Boston College subpoenas then truly the lunatics are now running the asylum. There will be those, of course, who will say that if Gerry Adams did order Jean McConville’s “disappearance” then he deserves to be prosecuted. In a normal society, one ruled by a normal government, that would be a difficult argument to answer. But Northern Ireland is not, even with the peace process, a normal society and nowhere is this more evident than in the administration of justice. The plain, undeniable fact is that there are double standards in the way justice is doled out in Northern Ireland. As myself and researcher Anthony McIntyre were battling in the Boston courts against the PSNI subpoenas last fall, the British prime minister, David Cameron, summoned the family of slain Belfast attorney, Patrick Finucane to Downing Street. Finucane had been shot dead by loyalist gunmen in 1989 but it is now widely accepted that British intelligence and the police in Northern Ireland, the Royal Ulster Constabulary (RUC), had foreknowledge of the murder plot and allowed it to happen. Finucane was a legal thorn in their flesh and what better way to remove it than by way of loyalist bullets? Such was the concern about this level of collusion in an attorney’s murder, not least here in the United States, that Cameron’s predecessor, Tony Blair, was obliged to announce that there would be a public inquiry into Pat Finucane’s slaying and we would all get to know just what part the RUC and British spooks had played in this dirty deed. But Cameron’s summoning of the Finucane family was not to tell them of a date for the beginning of this inquiry, but to inform them that he was withdrawing Tony Blair’s promise. There would be no inquiry into Finucane’s death. So those who say that the PSNI has a right to rummage through Boston College’s files for the names of the killers of Jean McConville must also justify the denial of that same right to Pat Finucane’s family to scour the files of MI5 and the RUC Special Branch for the names of those who colluded with his killers? Pat Finucane was a high profile victim of the Troubles in Northern Ireland, but not so Patrick McCullough. Who is Patrick McCullough, I can almost hear the reader ask? Well, he was a 17-year-old Catholic boy, just starting his first job in life, when he was shot dead in a loyalist drive-by shooting near his North Belfast home. Patrick died in June 1972, six months before Jean McConville was “disappeared” by the IRA. No-one has ever been held accountable for his killing and, unlike Jean McConville, there has been next to no publicity about his killing. He was his parents’ first-born and most loved child, the first of fifteen children when his life was suddenly and brutally ended. His mother and father never recovered from his death, and their loss was every bit as tragic and wrong as that suffered by Jean McConville’s family. I learned about Patrick McCullough’s death from a poignant letter his younger brother, Fr. James McCullough, a member of the missionary Kiltegan Fathers, wrote recently to the Irish Times newspaper seeking an inquiry into official indifference towards his brother’s killing. I contacted the priest to talk about his experience. When his brother was killed, the police never once visited the family home to tell them what was happening in the investigation. The only visit the family had from the security forces was shortly after the funeral when their home was raided by the British army. Fr. McCullough suspects that their purpose was to plant weapons in the home so as to justify his brother’s murder. The killers of Patrick McCullough are well known. An investigation in 2003 by the Belfast newspaper, the Irish News, discovered their identity while noting that no-one had ever been arrested or charged. Recently, the reporter who wrote the story confirmed to me that neither the HET, nor the PSNI, had ever contacted her to discover their names. There have been no subpoenas for Patrick McCullough. In other words, it never really happened. This is the last and most compelling reason why the Boston College subpoenas are not only dumb, but morally wrong. The HET is not a fit and proper body to deal with Northern Ireland’s past because it operates double standards. And Attorney General Eric Holder and the Department of Justice should not be helping these people do their dirty work in Boston. It is up to Irish America to make sure Holder gets that message. The US Attorney, Carmen Ortiz has just filed her reply to the briefs presented by our lawyers, Eamonn Dornan and Jim Cotter as well as the brief prepared by the American Civil Liberties Union of Massachusetts and on first reading one thing jumped out at me: the US government is finally admitting that one crucial justification for the original subpoenas against Boston College back in May, 2011 was false. 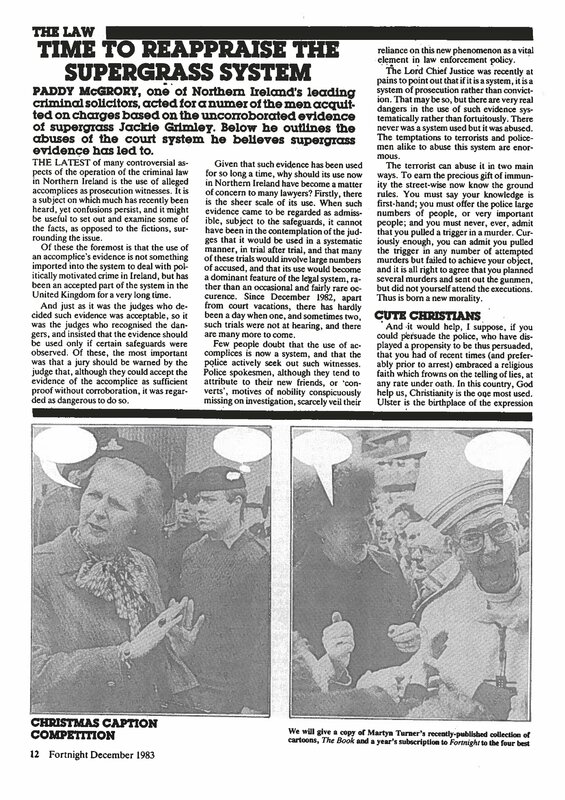 This was the claim that way back in February 2010, Sunday Life reporter Ciaran Barnes had been able to listen to Dolours Price’s interview with Boston College researcher, Anthony McIntyre in which she allegedly admitted her role in the disappearance of Jean McConville and three other people killed by the IRA in 1972. This was a crucial claim because if true it meant that someone at Boston College, either myself or Anthony McIntyre or Bob O’Neill, the librarian on the BC campus, must have breached the confidentiality pledge given to Dolours Price and therefore we could no longer claim that pledge as protection against the subpoena. So, according to US Attorney, Dolours Price had admitted all this in her interviews with Boston College and these tapes were then made available to Ciaran Barnes who wrote his report based on them. As regular readers of this blog will know, we have strenuously denied all of this from the outset and in a series of articles, here, here and here, have attempted to demonstrate that the information in Barnes’ article actually came from a taped interview with Dolours Price made by Allison Morris of the Irish News. In a deal with the Price family, the Irish News tempered its subsequent report but then Morris passed the tape onto Barnes who exercised no such restraint and compounded all this by dishonestly suggesting that the tape he had listened to came from Boston College. It was, of course, a device to protect Allison Morris and to hide the fact that the deal her editor had cut with the Price family had been betrayed. We now know, thanks to a piece Morris penned in the Irish News, that the PSNI made no attempt to investigate this matter until June 2011, a month after our exposure of the Morris-Barnes deception. By that time, of course, Morris was able to tell the PSNI that she no longer had the tape in her possession. Quelle surprise! Nonetheless, the tardy PSNI action was an admission that the basis for the first subpoenas served on Boston College was a lie. What has yet to be explained is why the PSNI did not approach either the Irish News or the Sunday Life back in February 2010 when their articles on Dolours Price were published. Was that just a one-off blunder by the PSNI or part of a pattern of preferential treatment to local newspapers whose political support is vital to the PSNI? The first part of that statement amounts to an implicit admission that the PSNI had fallen down on its job by ignoring the Irish News and Sunday Life reports in February 2010. The second part would have more validity had the PSNI tried way back in February 2010 to obtain Allison Morris’ tape but failed. The truth is that news reporting sources were available to the PSNI but they chose to ignore them. The US Attorney’s office in Massachusetts has now revised the original account of this episode but, tellingly, failed to explain the major differences between the original claims and what Ms Ortiz’ office now says happened. Notice the differences: no mention of anyone listening to Boston College’s tapes, merely an acknowledgement, and nothing more than that, that Dolours Price had told the Irish News that she had been interviewed by Boston College and, on one reading, a subtle suggestion that the alleged admissions of involvement in these disappearances were really made in the Irish News and Sunday Life reports. More, much more on this to come and if I was Allison Morris or Ciaran Barnes I would pay especial attention to this. Roy Greenslade’s disgracefully dishonest career as a Sinn Fein shill masquerading as journalist, academic and media commentator was comprehensively exposed today by Stephen Glover writing in the Independent. The delicious details can be read here. Followers of this blog will know that I have written before about Greenslade’s other life as a secret correspondent for An Phoblacht/Republican News but Glover adds more recent details about Greenslime’s covert existence as a cheerleader for the Provo leadership: that he spoke last June at a Sinn Fein conference on the 1981 hunger strike (we can be sure there was no mention of Richard O’Rawe there! ), has written under his own name for An Phoblacht (now that it’s safe to do so in these days of IRA ceasefires), has a holiday home in Co. Donegal (presumably adjacent to Costa del Provo) and counts Pat ‘Smiler’ Doherty, former IRA Director of Intelligence, as a friend. Why does he never reveal these very relevant details when he writes in the Guardian about matters Irish, Republican and Sinn Fein? It’s called disclosure Roy. Responsible journalists are supposed to disclose a conflict of interest when they have one, as you do when it comes to writing about Irish politics. You have a dog in the fight, as they say in this country, and your readers deserve to know that. This is one of those posts in which I don’t really need or want to write much myself or do anything more than reproduce a couple of articles and let them speak for themselves. 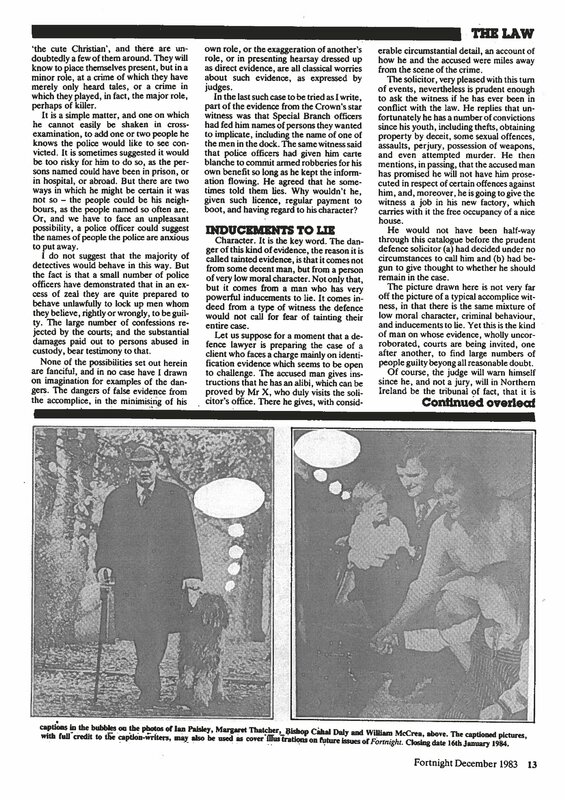 Last week a type of trial that I had thought belonged to the past and had been buried alongside everything else we want to forget from the Troubles, made its way back into the headlines and what was striking about the headlines was they could have been taken from any newspaper circa 1982 to 1984. 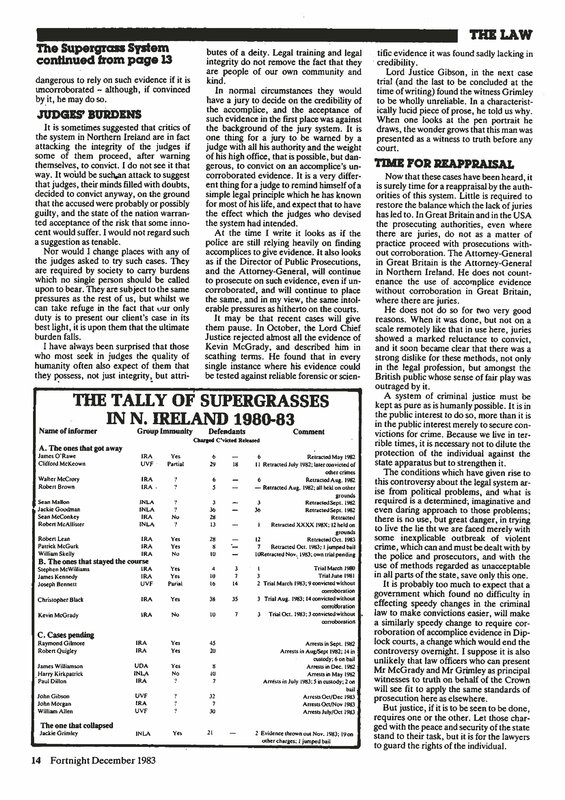 The trial was of a number of alleged UVF members arraigned on the word of two supergrasses, brothers as it turned out, and it collapsed in the same way and for the same reason as similar trials did in the 1980’s, which is that the brothers were such self-serving liars that no judge, not even one presiding over a Diplock court, could convict on their evidence. The only thing that was different from the 1980’s was that the terminology used by the state has been updated; back in the 1980’s the RUC called the witnesses ‘converted terrorists’, but now the PSNI has rechristened them ‘assisting offenders’. To everyone else, however, they will always be supergrasses. I don’t know why the PSNI has resorted to this despicable and discredited tactic but I strongly suspect that there may be a element within the police which wants to re-run the RUC’s failed plays to see if this time, now that the Provos have been sidelined and neutralised, they can succeed. It may also have something to do with the influence of English cops at the top of the PSNI, characters who know little if anything of Northern Ireland’s troubled past but have their eyes on ending their careers in glory.Who knows? But what struck me in the aftermath of this modern day supergrass fiasco was the defence of the tactic mounted by the North’s new Director of Public Prosecutions, Barra McGrory. Time for disclosure. I have known Barra, his mother and sisters for more years than I care to recall and I regard them as good friends. But it was his father Paddy, or PJ as some called him, who was the special McGrory family member for me. Paddy was more than a friend, he was also a sort of mentor, in that he guided me through the strange world of the Northern Irish courts, solicitors, barristers and judges and the equally bizarre universe of Irish Republicanism, two subjects on which he was both entertaining and instructive. We worked together on so many stories, he the media savvy but always utterly principled lawyer, me the story-hungry, eager-to-learn reporter that I like to think we forged a unique and productive partnership that occasionally struck fear in the hearts of prosecutors. I learned from him that there was no place more rich in stories and valuable insights than the courts and the extraordinary people who inhabit them. I don’t think I ever got over his death. I still miss him terribly and yearn for the opportunity to pick up the phone to talk endlessly about whatever was on my mind, as we often did. I wish he was around to talk to right now, for reasons that need no explanation to regular readers of this blog. You can watch him here, being interviewed in the wake of the Gibraltar inquest in 1988. Paddy starts to speak at about 1:50 minutes in. Anyway here are Barra McGrory’s remarks as reported by the BBC’s Vincent Kearney this week and below that is an article that Paddy, his father wrote on the same subject for Fortnight magazine in the winter of 1983. As I wrote in the introduction, I won’t make any comments. I sort of think the two pieces speak for themselves. Enjoy. Unreliable and ravaged with alcohol and drugs. That was how a judge last week described the two main prosecution witnesses at the end of the loyalist supergrass trial last week. Mr Justice Gillen acquitted 12 men of all charges against them, including nine who were charged with the murder of leading UDA member Tommy English. In his judgement, the judge demolished the credibility of Robert and Ian Stewart, two self-confessed UVF members who admitted their involvement in the murder and agreed to give evidence against their alleged accomplices. In return, they each had their sentences reduced by 19 years and are now living at a secret address outside Northern Ireland, with assumed names. His comments led to widespread criticism of the decision to take the case to court and calls for an end to that kind of trial. In his first broadcast interview since the trial, the Director of Public Prosecutions has defended the use of the Serious Organised Crime and Police Act 2005, which allows evidence from “assisting offenders” to be used in court. 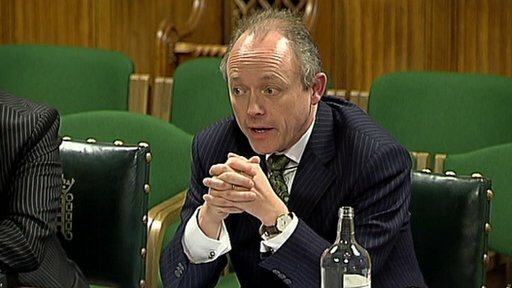 Barra McGrory QC said the decision to prosecute those on trial had been taken after an extensive debriefing of Robert and Ian Stewart by experienced police officers. They then recommended that the prosecution and PPS lawyers examined the material they provided before taking the case to court. So why had the discrepancies in their evidence highlighted by Mr Justice Gillen not been identified by those who carried out the debriefing? “The difference is that Mr Justice Gillen was able to come to those conclusions after extensive cross-examination by no less than nine different legal teams poring over the material,” Mr McGrory told the BBC. “That is the function of the trial court. “The risk here is that the prosecutor might seek to circumvent the function of the trial court by conducting what is really a trial within a trial, in order to come to the decision as to whether or not to prosecute. “That is not our function. If that was our function, this would be a totalitarian state without the benefit of an independent judiciary. The PPS is conducting a review of the evidence given by the Stewart brothers to establish whether they breached the terms of the agreement that resulted in their sentences being reduced by 19 years. If the conclusion is that they knowingly failed to provide the assistance, their reduced sentences could be reviewed. The PPS director also defended the cost of the case, which it is estimated could be around £20m. “In general, I have to say that I would be very concerned about a practice on behalf of the prosecution that would factor in the potential cost of a case in the decision, as to whether or not it is legally justifiable to take the case to court. Mr McGrory denied that last week’s acquittals and the criticism from the trial judge were major embarrassments for the service he leads and the police, and said they did not discredit the legislation that made the trial possible. As a newly qualified lawyer during the 1980s, he witnessed the collapse of the original “supergrass” system, which produced 100s of convictions, the majority of which were later overturned. The PPS director said the 2005 SOCPA legislation was entirely different because there was greater transparency about the criminal backgrounds of the offending witnesses, and what they received in return for their evidence. “The lesson that has to be learnt from this case is that very great care has to be taken in the evaluation of evidence of this kind. I asked if he had any concerns that last week’s judgement may have fatally undermined the 2005 legislation and jeopardise similar trials in future. “No, I don’t,” he replied. “Mr Justice Gillen was very careful to say his concerns were the particular witnesses in the particular circumstances of this case, that that was not to say that the procedure wasn’t a valid procedure. I understand that in order to declare the agreement null and void, the PPS would have to prove that the Stewart brothers knowingly failed to provide the assistance they promised. In his judgement on Wednesday, Mr Justice Gillen branded the brothers liars and said they weren’t intelligent individuals, but he didn’t say they had done this knowingly and he didn’t say they had breached the terms of their agreement. We also know that there are a number of trials based on this same legislation due to come to court this year, so the PPS may be reluctant to act in a way that could discourage other more plausible witnesses from coming forward.